So, quite obviously, this belongs to the Nature of the Hunt deck and is the second of three Legendary creatures for those three colors. Not a bad card, and not an easy creature to get rid of... Obvious found in the Mind Seize deck. So essentially, every gets to draw a second card in their draw step. This means you would draw two cards, as would all your opponents... However, whenever one of your opponents draws a card, they lose two life, so with this is play, you opponents lose two life in their first main phase. 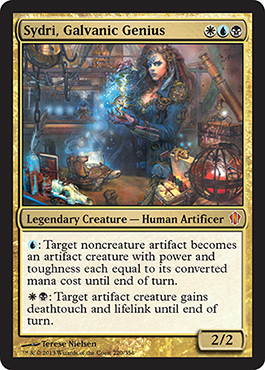 Sydri, Galvanic Genius is the second legendary creature for the Eternal Bargain deck. 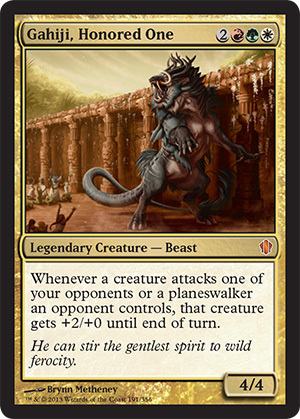 I personally really like this particular legendary creature. For three mana, you get a 2/2 that can make a normal artifact an artifact creature where the power and toughness is equal to the converted mana cost (similar to Tezzeret, Agent of Bolas's second ability) and also give artifact creatures deathtouch and lifelink. Having the ability to turn any artifact into a creature for one blue mana and then being able to give it deathtouch and lifelink with a white mana and a black mana. 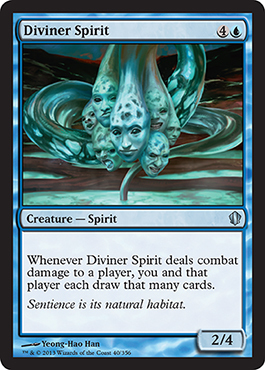 I can see people using Sydri outside of this deck since she has some great abilities and defines Esper's primary identity of artifacts, along with the deathtouch of black and lifelink of white (and black). 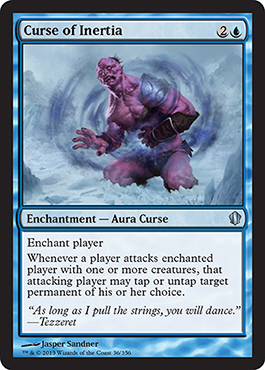 Another curse (probably going in the Mind Seize deck) allows for a chosen permanent to be untapped by a player who attacks the cursed player. Five mana for a 2/4 creature that allows for you and a player you attack with it to draw a number of cards equal to the damage dealt to that player. As long as your opponent cares about card advantage, they may not care about taking too much damage if they can get more cards in their hand. This card will probably be found in the Evasive Maneuvers/Bant deck. Five mana for returning a creature from your graveyard to the battlefield and offering the option to your opponents (in exchange for you getting another creature back) is a pretty good card and there may be some interesting shenanigans that will go into a deck with The Mimeoplasm from the 2011 decks outside of these decks, so it could definitely see play in EDH (and potentially become a black staple in the format). I'm not sure which deck this could show up in, but might be in the Grixis/Mind Seize deck. I feel like this belongs in the Naya/Nature of the Hunt deck, although it may fit with the Jund/Power Hungry deck. 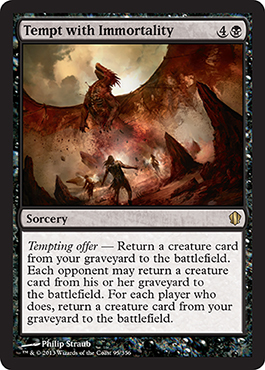 I'm torn, really... Tokens and Counters may be involved with whatever deck this is in, and that kind of describes a portion of both Jund and Naya. So, for five mana, tokens get doubled when they enter the battlefield and if +1/+1 counters are placed on a creature, that number of counters is doubled. 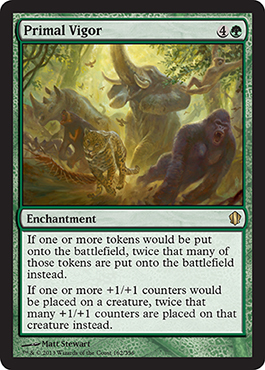 Of course, this resembles Doubling Season except for a small change... Primal Vigor does this for all tokens and all counters, not just yours. Not sure if this is really something good or not, but here's hoping the deck that this belongs in has some sort of shenanigans to stop doubled tokens and counters that your opponents control. 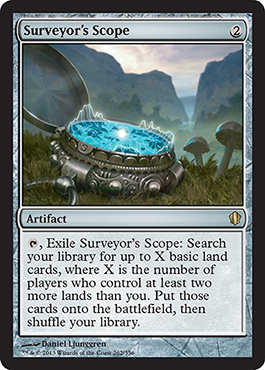 This card fits with the multiplayer aspect of Commander in that it allows you to search for a number of basic land when that number of opponents has two or more land than you, and you get to place them on the battlefield (not tapped). Surveyor's Scope is exiled when doing this. So, starting out, this is obviously an artifact card frame, so "Artefatto" means "Artifact." Simple enough, right? So, now for the name... Other than "del" meaning "of," I can't get any of it. But the people over at MTG Salvation say this is "Eye of Doom," so we'll trust them. In French, "quand" means "when." so I will therefore infer that "Quando" is Italian for "when." Let's now consider the phrase "entra nel campo di battaglia," well, what does that look like to you? "Entra" must mean enters" and "campo di battaglia" probably translates to "field of battle" or "battlefield." Simple, right? "When Eye of Doom enters the battlefield," and then it gets difficult. "un permanente" clearly means "a permanent" since it closely resembles it, and then we have "non terra" which has to mean "non land." Later, we see "destino" which is probably destiny, or fate. Then we see "Sacrifica" or "sacrifice" and "Distruggi" probably means "Destroy" since it resembles that word. "When Eye of Doom enters the battlefield, each player chooses a nonland permanent and puts a fate counter on it. , [TAP], Sacrifice Eye of Doom: Destroy each permanent with a fate counter. I think I did fairly well. Looking at the translation with the card, "ogni" must mean "each," "segnalino" means "counter" and "giocatore" must mean player. But see how much you can glean off foreign cards without having to translate the text with Google or a dictionary? And I promise I did this with a clean slate. I only looked at names, and then at cards, not the other details, so therefore these small translations by me are actually just my knowledge and ability of figuring out meaning of foreign cards. 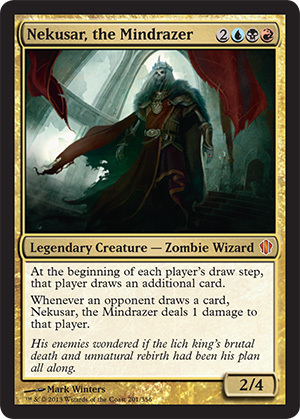 Hope you guys enjoyed this edition of Commander Spoilers.